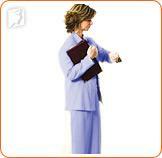 Everyone needs a job, but some particularly stressful and demanding positions can heighten menopause symptoms. In fact, stress is one of the most common - albeit manageable - symptoms . Read on to learn how you can cope with your hot flashes at your retail job. If you're working in a retail job, then you'll know how stressful a position like that can be: angry customers, low stock, chaos during sales. It's easy to get worked up or feel stressed by a barrage of impatient, demanding customers. However, getting stressed is the last thing you want to do. Try to stay calm, no matter how challenging the situation becomes. You can do this by counting to ten and breathing deeply when you start to feel stressed. This can help you to focus on staying relaxed and take your mind off the stressful situation. You can also practice deep breathing techniques off the clock to help prepare your body in case a hot flash does strike at work. Unwind from the day with soothing music, a bubble bath, reading time, meditation, or whatever relaxes you most. It is important not to let stress - from your job or elsewhere - accumulate day after day. There's nothing worse than that dreaded feeling of a hot flash coming on, especially while you're working. When you feel a hot flash coming on at work, it's helpful to have a cool drink at hand. You can place it behind the counter, but remember to keep it away from any electrical items, as this can be hazardous. You may also want to try keeping a handheld fan on your person for extra relief. Many people are not in a place where they can quit their job and search for another. However, you may be able to take on a different role at your current job if your hot flashes are still unmanageable, even with lifestyle adjustments and stress reduction techniques. For example, your supervisor may be able to move you from a stressful register position to doing stock in the back, where things are calmer. That way, if you do experience a flash, it will not be in front of people. If these changes are not enough, more drastic treatments may be needed to ensure that you are flash-free at your retail job. Van Muhlen, DG, et al. "A community-based study of menopause symptoms and estrogen replacement in older women." Maturitas. Sept 1995; 22(2): 71-8. Hot flashes can be accompanied by headaches, dizziness, and nausea. Read on to know more about headaches and hot flashes. Hot flashes occur when there is a slight malfunction with the body's response to regulating temperature. Learn more about their link with alcohol.